The Ecological Design Center announced last week that the third and final phase of its $100,000 project to bring solar energy to the University of Oregon campus is complete. The new Solar Kiosk (powered by SunView interactive software) will provide every student who visits the UO's Student Recreation Center (SRC) with real-time information about exactly how much power the rooftop array is producing. The real-time information will also be available at the EDC's website. In the spring of 2001, the Ecological Design Center (EDC) was awarded a $100,000 grant from the Associated Studens of the University of Oregon (the student government) to install a grid-tied photovoltaic system on university rooftops. The grant’s goal was to fund enduring and environmentally responsible projects that benefit the entire student body. The Ecological Design Center was able to increase the size of the project by 25% by taking advantage of a tax credit given by the Oregon Department of Energy for renewable energy projects. With this money, the EDC successfully installed a 3-kilowatt (kW) solar array at the Erb Memorial Union, phase one of the project, as well as the 12-kW array at the SRC, the second phase of the project. The power produced by these two solar arrays also offsets a portion of the UO’s utility bill, and has done so since installation. The EDC’s original proposal to the ASUO outlined three main goals for the Solar project: to produce clean, renewable energy; to put the UO on the map as a "green" campus; and to generate energy that would save money for the student body. This project is a showcase for future energy-conscious development on campus and a multi-departmental cooperative effort made it possible. The 12-kW solar array is composed of 84 modules and sits on the roof above the SRC’s basketball courts. It was installed by Energy Design Co. and Solar Assist, subcontractors for L.R. Brabham. The 84 150-Watt modules were made in Spain by Isofoton. The four inverters used were 'StarInverters' produced in Bend, Oregon by PVPowered,, who also provided technical assistance for the Solar Kiosk project. Housed in a wooden cabinet and mounted on the wall opposite the SRC’s rental desk, the Solar Kiosk is designed to meet both observation and educational needs. It contains a computer and monitor that relays real-time data about how much energy the photovoltaic panels are producing, and how much energy they have produced since installation. The Solar Kiosk will also provide general information about the benefits of solar power, including the reduction of greenhouse gas emissions, the decentralization of power production, and the lack of dependence on foreign oil. This same information will also be available to anyone with Internet access through an interactive website at http://edc.uoregon.edu/solar. The EDC’s Campus Sustainability Coordinator, Jesse Jenkins, who is a computer science major, designed the software needed to translate the solar data into a readable display with a team of UO computer science undergraduates. Graduate architecture student Dustann Jones then built the wooden cabinet that holds the display. This final phase of the solar project received funding through EWEB’s Partners in Education program as well as a generous contribution from Architecture Professor Emeritus, John Reynolds. The National Oceanic and Atmospheric Administration (NOAA) issued the latest global Annual Greenhouse Gas Index (AGGI) today, its benchmark measurement of gases in the atmosphere that affect the Earth’s climate. This year's AGGI shows a continuing, steady rise in the amount of heat-trapping gases in the atmosphere overall. 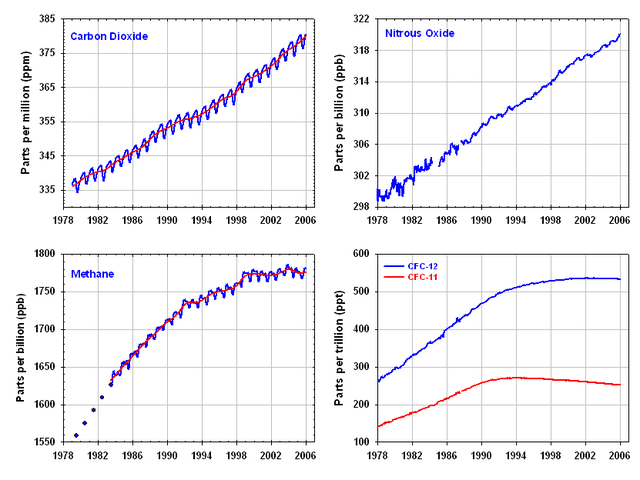 That steady increase reflects an increase in carbon dioxide (CO2) and nitrous oxide (N2O) but a leveling off of methane (CH4), and a decline in two chlorofluorocarbons (CFCs), gases that contribute to the cause of the Antarctic ozone hole [see figures below]. According to NOAA, the AGGI is referenced to a baseline value of 1.00 for the greenhouse gas levels that were present in the atmosphere in 1990. The value of the AGGI for 2005 is 1.215. 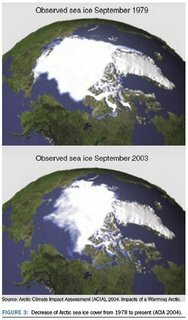 This reflects a continuing upward trend in the accumulation of greenhouse gases, as well as the change in the amount of radiative forcing. Radiative forcing indicates the balance between radiation coming into the atmosphere and radiation going out, NOAA explains. Positive radiative forcing tends on average to warm the surface of the Earth, and negative forcing tends on average to cool the surface. Radiative forcing, as measured by the index, is calculated from the atmospheric concentration of each contributing gas and the per-molecule climate forcing of each gas [i.e. the global warming potential (GWP) of each gas]. The constant or declining growth rates of methane and CFCs have slightly slowed the overall growth rate of the AGGI, NOAA reports. Methane concentrations have been holding relatively steady since 1990. This is mostly attributed to an equilibrium that has been reached between sources of emission of the gas, its duration in the atmosphere and areas where it is taken out of the atmosphere. Another positive result is the fact that CFCs are continuing to decline. Along with creating the ozone hole over the Antarctic, CFCs are also very powerful greenhouse gases [HFC-23, for example, has a GWP of 260 times that of CO2!]. 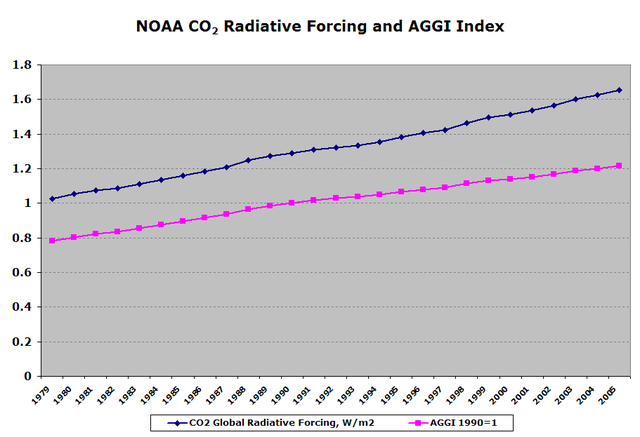 According to NOAA, most of the increase in radiative forcing measured since 1990 is due to CO2, which now accounts for approximately 62 percent of the radiative forcing by all long-lived greenhouse gases. During 2005, global CO2 increased from an average of 376.8 parts per million (ppm) in 2004 to 378.9 ppm, NOAA reports. This increase of 2.1 ppm means that for every one million air molecules there were slightly more than two new CO2 molecules in the atmosphere. The pre-industrial CO2 level was approximately 278 ppm. NOAA's AGGI, produced by the Global Monitoring Division of the Earth System Research Laboratory in Boulder, Colo., is a recently developed index that provides an easily understood and scientifically unambiguous point of comparison for tracking annual changes in levels of atmospheric greenhouse gases. The NOAA AGGI will be included in the annual Greenhouse Gas Bulletin issued by the World Meteorological Organization (WMO) in November. The AGGI is based on the analyses of atmospheric levels of all the major and minor long-lived greenhouse gases, and factors in the relative strengths of each gas in its ability to trap heat. The gases include carbon dioxide, methane, nitrous oxide, CFCs and the current replacements for CFCs, and have been measured since 1979 by NOAA's global sampling network. 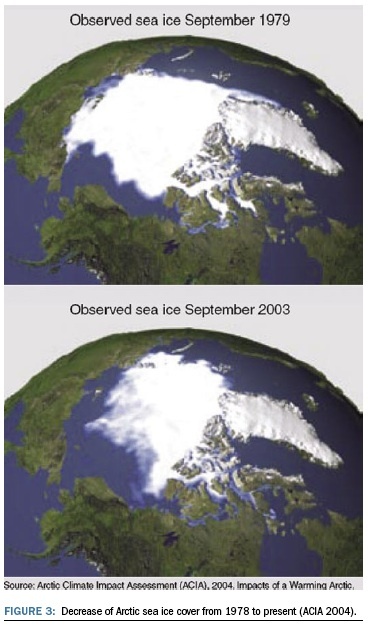 Atmospheric greenhouse gas levels change from year to year depending on natural and human-influenced processes. According to NOAA, the largest annual increase in the AGGI, 2.8 percent, occurred between 1987 and 1988 while the smallest was .81 percent from 1992 to 1993. The index has increased in every year since NOAA's global measurements began in 1979. However, according to this year's AGGI, the increase during 2005 was 1.25 percent, which is relatively low. NOAA's network of five global baseline observatories and about 100 global cooperative sampling sites extends from the high Arctic to the South Pole. Samples also are taken at five-degree latitude intervals from three oceanic ship routes. A Baltic ferry line collects samples as it makes its daily crossing. All samples are then sent to Boulder for analysis and comparison with NOAA's world standards for the gases.